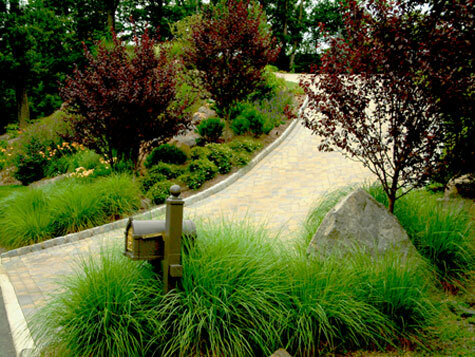 Driveway designs are an important part of the landscape and can be both welcoming and dramatic. But what does it take to create a driveway that is both great looking and functional? I love creating driveways! You might think that's odd. However, the reason I enjoy it is that it is so important. After all, it's the first landscape element that someone uses; it allows them (or your) to enjoy the first glimpses of your landscape. Design Types - what shape and style would you like...basic, circular, courtyard or crossover? 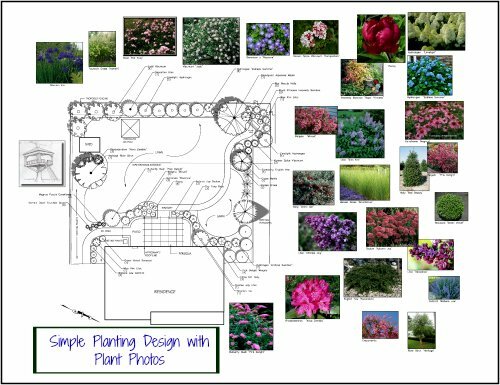 Design Elements - consider such things as driveway parking, width, driveway drainage, turnaround and backup areas, lighting, edgings, entry aprons, possible driveway gates, and plantings. Materials - which ones will you choose and what are the cost factors? 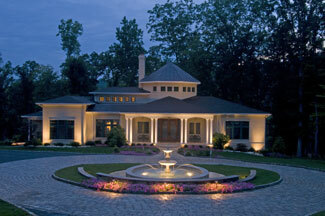 Certain features of your landscape and home will help determine possible driveway designs and ideas. There is the location of the driveway entry, and there is the layout leading to the destination....the garage or driveway parking area. Ahh, but it's the in between that's the puzzle! Is the distance long or short? If it's short, you often must follow a direct route. A long driveway offers more choices. Another aspect to plan for is directing surface water correctly. To learn more about this, please visit my page on Driveway Drainage. See my page on driveway dimensions for a complete list. A driveway can lead straight from the road entry, where you might have a decorative driveway apron, to a side garage. In this case, the turning radius into the garage is one of the elements of the design, and it must function well. I use a 10 - 15' radius on the turn. In addition, the amount of space needed to back up out of the garage should be a minimum of 30 feet, but a little longer is better. You might have to do a K turn if you want to drive out forward. When you do the design, if there is room, a good idea is to include an extra back up area so that you can back the car up and drive out forward. This space can also double for extra parking. It can extend into the rear yard or it can be angled past the rear driveway corner. It should be a minimum of 10' wide and 18' long. Double the width if you would like parking for two additional vehicles. And the same turning radius applies. Here is a drawing I did for a client that shows how extra parking can be created in an interesting way. The densely paved area is a terrace/sitting area adjacent to the front entry porch. For designs where the driveway is far from the front door (or even if it is not! ), you can insert parking where the walk would begin. What does this do? This brings you closer to the front door. Parking is created where there might have not been room. It creates a "courtyard" like setting. You can outline the parking area with edgings for interest. To see how I designed one of my projects and also see a video of it, please visit my page on Driveway Ideas. 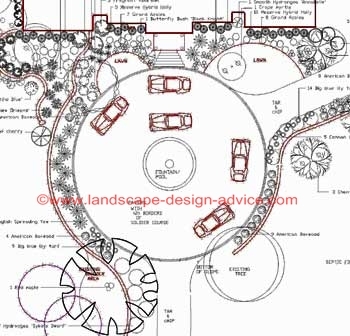 Circular driveway designs are also popular and might be a good choice as long as you have the space. 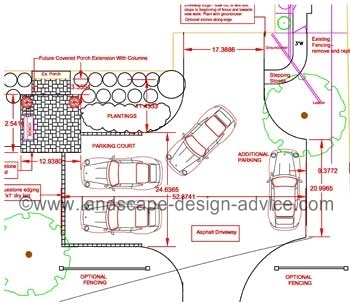 A circular driveway design typically begins at the street, travels across the area close to the front door, and continues out to the street again. It is basically a loop. In addition, it has an area which leads to the garage. The circular section of the driveway near the front door should be 70 feet from outside edge to outside edge. This also allows for a center area of lawn, plants, or a fountain. As long as the outer diameter is 70 feet and the driveway width is at least 10 to 15 feet wide, the circular driveway will work. Go back and quickly take a look at the first picture on this page. The drawing below is the AutoCad drawing and design for that project. Below is also the finished project for the above drawing. It shows the driveway area near the front door. What drama! 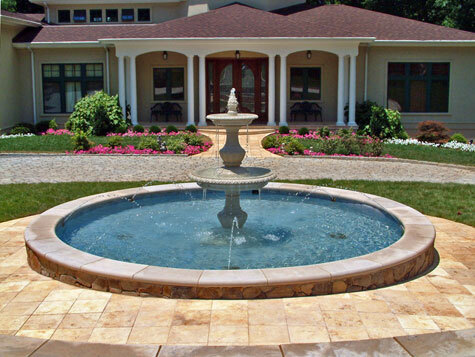 the fountain is a focal point, but so is the house. You can see in the drawing that the design is a complete circle. 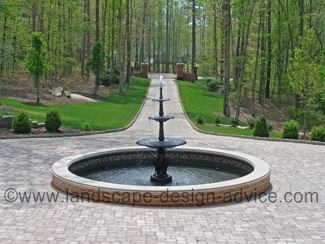 The driveway design has a central pool and fountain. The circle is 70 feet wide and the pool area has a diameter of 20 feet. Two cars can pass each other as they drive around the circle. Courtyard designs can be contemporary looking or reminiscent of old European estates. The central area becomes more dramatic when you use a different paving material or provide a border. This area can be square or circular. 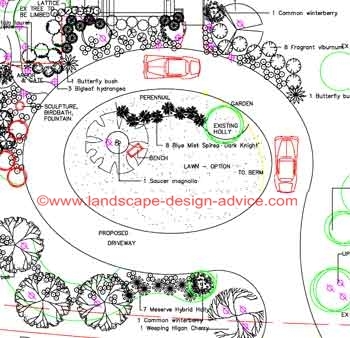 A circular design should have a diameter of 70 feet, the same as a circular driveway with plantings, etc. in the center as mentioned above. If the courtyard is square, the minimum length and width should be 55 feet. I know this sounds huge, but actually it is what is needed to maneuver a vehicle comfortably. See what driveway courtyards cost in different paving materials. The circular driveway here is also 70 feet wide. However the diameter of the center lawn area/fountain is 48 feet. Except for at the front door, the rest of the circle is wide enough for only one car. Here is a video of the above project. This design of mine won two awards. One was for the fountain design and installation and the other was for the lighting design! 1. The main entrance drive is tar and chip. 2. Belgian block curbing was used. 3. The circular courtyard area was done in granite (matching the curbing). 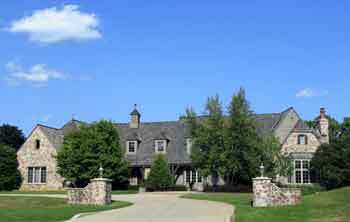 Please visit cobblestone driveway designs. Perhaps you might like to include an impressive garden fountain in the center of the courtyard. In my opinion, it's difficult to find a fountain that does not look tacky. You want one that is well made and elegant. I found two fountains recently that I think are very special and elegant. Take a look at my page on limestone fountains, where I show pictures of them. One is from Haddonstone and the other is from Longshadow. This is an interesting type of design that can be beautiful! With this type of driveway design, the entry begins at one side of the front of the property, crosses over along the front and exits on the other side. Here are some things to note about it. It has an area that also leads to the garage,whether it be a front or side garage. The length of the straight area near the front door should be a minimum of 18 to 20 feet, which is the length of a typical parking space. Every additional 18 feet length will allow parking for one additional car. Include a pull off/parking area so that someone can park and not block the passageway. This parking area can be created by widening the driveway near the front door so that one car can pass another one. It can also be placed off to the side. A nice design feature is to emphasize the driveway area just along the front of the house. This can be done by creating a different paving here or even just edging the area. As an aside, typical turning radii for driveway entries are 10 to 15 feet. Driveway designs should be a minimum of 9 feet wide. This provides a narrow look which I like. Why create more hard surface in a landscape than is necessary? However, there might be reasons for to have a wider one. You might have very large vehicles, perhaps large trucks, that often need to use your driveway. The maximum width I would go would be 12 feet. It is not that long and you need it for parking side by side. Your driveway should then be 18 feet wide. 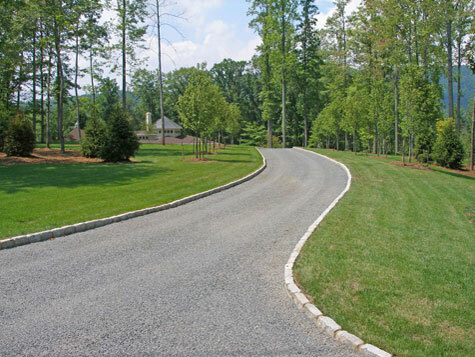 Your driveway has curves and you might feel more comfortable with a wider space. You can make it anywhere from 10 to 12 feet wide. 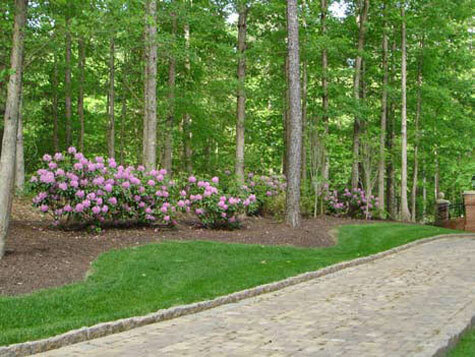 The driveway landscape and how to create a planting design is also very important for a finished look. You might address the entry, the driveway sides and where the driveway design ends. 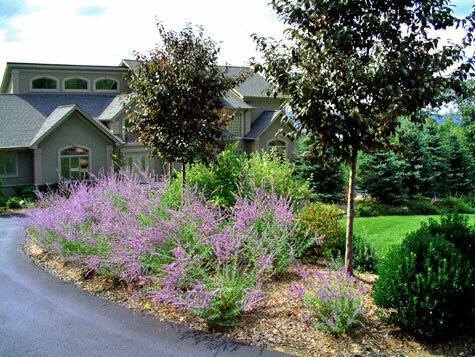 Driveway landscape designs are important to the overall look. I have also written a page with lots of information on driveway lighting. Loose stone - this is the least expensive option. There are a variety of stone sizes, colors and textures available. Tar and chip - a combination of loose stone and asphalt are combined. In the beginning this material is loose, but it hardens over time and provides a textured appearance. Asphalt - a popular and inexpensive choice. Concrete - subject to cracking. Stamped concrete - see photos. 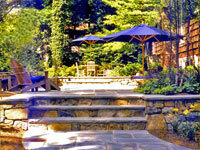 Concrete pavers - a paver driveway design can be used for the entire area or in certain areas. Also visit driveway pavers. Brick - see pictures. A brick driveway can be either dry laid or set in mortar. Travertine pavers - yes, they are appropriate for driveways. Natural stone - various types are available but strength specification must be checked. One of the nicest natural stones that you can use for driveway designs is granite, usually known as cobblestones. True cobblestones are made from granite which is one of the strongest paving materials. 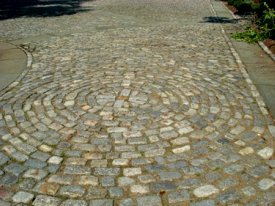 New or old cobblestones make an elegant driveway design. However, the reclaimed stones have a look unto their own! With all the various driveway materials that are available, it's sometimes difficult to choose the right one. Select one that fits your budget and remember it is only part of the landscape.